Like all disruptive technologies, Bitcoin presents a number of challenges that need to be overcome in order to achieve mainstream adoption. Probably the most critical one is to provide consumers with the right tools to secure their bitcoins. Bitcoin is akin to digital cash and is totally decentralized. This means nobody can reverse a transaction, and if you were to get your bitcoins stolen, no trusted authority would be able to retrieve them for you. Of course you don’t physically own bitcoins. What you do own, and what you need to thoroughly protect, are your “private keys”, the secret part of your Bitcoin account. These private keys are used to sign transactions, effectively spending your bitcoins. Who controls the private keys of an account, controls the bitcoins. It is therefore paramount to protect these secrets from a prying eye. Anyone knows how to safely store gold: buy a safe, dig a hole in your garden, put it into a vault, etc. But efficiently protecting a piece of data stored on a computer against malwares and keyloggers is another story: most people, including many geeks, wouldn’t know where to begin, considering that computers are designed to make copying data trivial, especially over networks. Store your bitcoins on paper wallets, just the way you would store gold. Effective, but sacrifices usability, as you won’t be able to spend them on the go. Deposit them in Bitcoin banks or online vaults. Sacrifices control and property in exchange of an I.O.U. Do nothing: use a software-based wallet. Pay and pray. This is what the majority of people choose to do. Until something bad happens. Use multi-signatures: to send a payment, you need to wait for the signature of other parties (individuals, risk management companies or automated services acting as a second factor). Secure your keys using a specialized physical device, a “hardware wallet”. You can also use some combination of the above and devise your own strategy. But eventually, in order to achieve mass-market adoption, we believe only two options will be left standing: the Bitcoin bank, or the hardware wallet. The Bitcoin bank will ask you to trust your bitcoins to their care. It is a very simple and efficient solution to solve the security problem (as these people are security professionals), and can help drive adoption. However, it requires blind trust in a third party, as you will need to give them full control of your assets. A hardware wallet protects your private keys by storing them inside an external device that cannot be hijacked by a malware. Thus, you can spend your bitcoins even on a computer full of viruses without taking any risk. You keep full ownership of your bitcoins, without depending on any third party, and you can always access them anytime, anywhere (as long as you physically carry the hardware wallet). 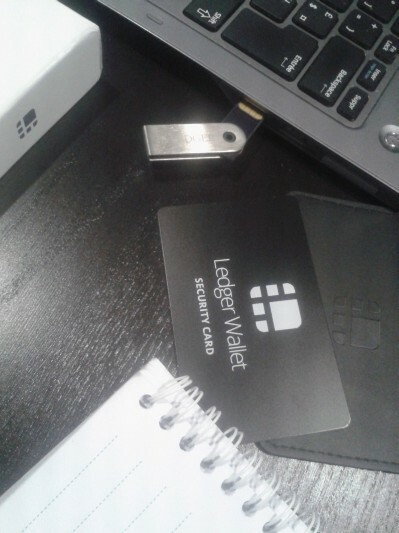 At Ledger, we believe hardware wallets are the definitive solution to solve the end user’s security problem of Bitcoin. But not just any hardware wallet: only solutions built on secure elements can provide state of the art security coupled with affordability. At the end of the day, the price point of such a device must be negligible. This is the only way to achieve mass adoption. Since 2012, our team of crypto, IT and embedded hardware experts has been developing prototypes and production-ready units, such as the HW1. Today, we are proud to unveil the Ledger Wallet Nano, a small, affordable, secure yet easy to use hardware wallet. It is built on the HW1 specifications, with an easier to use second factor. It is supported by a growing list of independent software wallets, and of course by the Ledger Wallet Chrome app which provides a top-notch user experience. The Ledger Wallet Nano is available worldwide, for immediate express shipping. Our approach is totally decentralized, based on open specifications and open sources. You can use the Nano with a growing number of independent wallets, such as Electrum 2.0 or Greenaddress. As we ramp us production for the Nano, our engineers are already working on the next generation hardware wallet with an embedded screen. Securing private keys is aking to securing digital identities. By leveraging identification protocols such as BitID and providing with simple APIs, Ledger will act as a simple plug and play login device. Soon, you’ll be able to connect to third party websites just by inserting your hardware wallet into your computer. Addressing a global booming market, Ledger aims to become the leader of digital identity security for distributed consensus technologies such as Bitcoin.